Then, come train with Just Act’s Executive & Artistic Director Lisa Jo Epstein Ph.D, a seasoned T.O. leader with more than 2 decades experience teaching Theatre of the Oppressed techniques, facilitating applied T.O workshops & residencies, as well as jokering public Forums. Are you ready? Get set! Go! 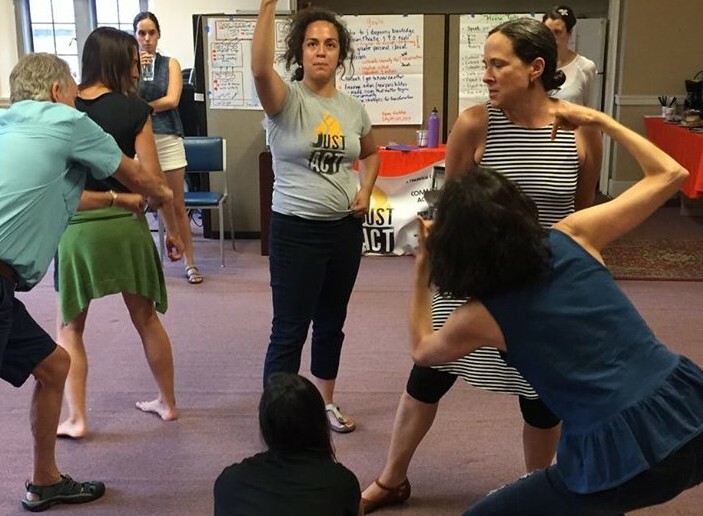 Come to Philadelphia this summer to the JUST ACT INSTITUTE for Theatre of the Oppressed. Educators, facilitators, social workers, artists, activists, organizers, healers, creative place keepers and makers, investigators of human relations of all kinds, Just Act offers multi-level T.O. technique training for those embarking on a journey to go deeper with your practice within an anti-oppression framework. Then the Just Act Institute is for you. Our experiential model for processing T.O. ‘games’—experience, reflect, generalize & apply—is unique to Just Act. It enables our training to dive deep to root issues, enabling people to internalize, not intellectualize, refreshing discoveries, and practice making change with compassion and new courage. Learn, strengthen and expand personal and professional skills in using Theatre of the Oppressed as a tool for social change as well as interpersonal and community healing. Gain skills and knowledge in Theatre of the Oppressed while creating and practicing ways of promoting healing and taking empowered, just action around complex, often divisive, systemic challenges where you work and live. Activate awareness through embodied exploration of oppression paired with a creative critical reflection process unique to Just Act. I think the most powerful thing for me is this idea of revising, re-creating, rehearsing, deconstructing, etc. When things happen that are unjust, it’s a powerful to be able to see those things as fodder for re-imagination, for creativity, for generatively, for transformation…For me, I came away thinking of TO as a kind of social dreaming. techniques to improve your ability to effectively engage JEDI concerns–justice, equity, diversity &amp; inclusion–, and use interactive theatre as a tool for personal, interpersonal as well as community repair and change. Our Forum Theatre Intensive culminates in a free public performance of the Forum Theatre pieces created by participants. Foundational training in the theories and techniques of Forum Theatre & Theatre of the Oppressed. Practice the techniques within an anti-oppression framework developed exclusively by Just Act. Experience spect-actor intervention with community members. Engage in self and relational transformation as you practice new patterns of action and thinking that will also support work on external structural change. What happens in our bodies, feelings and thoughts when we do a TO activity. How these aspects—including how we read the non-verbal body language of others—inform the action choices we make. The challenges to changing our patterns of behavior—ie the ways in which we mobilize social power–in our everyday social interactions, and thus unconsciously perpetuate inequitable systems of oppression. What is the impact on our own bodies and minds of these habits, of this social conditioning that may in fact be sabotaging our social justice efforts. How to access & utilize our radical imagination to flip the scripts & author new narratives. Click below to reach the Registration Form! Lisa Jo is a masterful maestra with an uncanny gift for tapping into our heart's inner hunger to educe something luminous, vast, and Divine! She can transform any place into a safe space for diverse groups of individuals to cast aside our inhibitions and trust her process. Lisa Jo’s passion is infectious and her keen ability to empathize with a broad spectrum of humanity allows her to effectively gauge the general emotional state of her players and improvise during any situation at any given moment to fulfill the needs of the group she’s working with. When you couple Lisa Jo's unique intuitive sense with her high-level expertise then you get a facilitator who is brilliant, piercing, and dynamic! If you have taken at least one Theatre of the Oppressed training with Just Act or the equivalent, and have some experience using TO and jokering public Forum Theatre events, then these 2 workshops are for you!! 2 workshop options available to meet different needs. Sequencing & Facilitating T.O. games-ercises. Forum Theatre and all of the tools of Theatre of the Oppressed kindle a new sense of hope and understanding that moves participants beyond perpetuating internalized and openly oppressive behaviors to realizing their ability to confront thorny realities with innate intelligence, creativity and purpose. Games-ercises & Image Theatre for group-building, cultivate knowledge awareness, analysis of shared challenges, envision solutions & stepping stones to change. Options: 1-3 days, 8 hours/day; or customized to a 90 minute- 3 hour training. A serious and fun introduction to the ways in which Theatre of the Oppressed techniques make the invisible visible, with a focus on systematic oppression and an awareness of the emotions and actions that perpetuate injustice on a local, individual level. facilitation to grow trust and group cohesion across difference. A shorter training on Forum Theatre that introduces the basic elements of Forum Theatre. Learn to build consensus and rehearse solutions to implement in the real world. Cop in the Head, Rainbow of Desire, Boal’s method for theatre & healing from internalized oppression as a result of systematic oppression. Raw and real theater was created from the energy and experiences within the room. I experienced the reality of a spect-actor, and for me it really made theater much more accessible, which is my personal mission with my craft. Beneficial elements besides the whole weekend? I would say finding new ways to explore conflict internally and externally.